Whether you own a hair salon, barber shop, nail salon or spa, you know that keeping a large supply of salon towels is essential. Bulk ordering sounds so simple, but finding nice quality products at reasonable prices is hard. 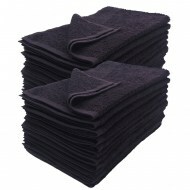 Is there a place where you can find wholesale black or white salon towels? Yes: Towel Super Center! When you wrap yourself up in a towel, you expect it to feel soft and plush. Your towels should retain their absorbency and last a long time. Salon towels are the best kind of towels to do this. 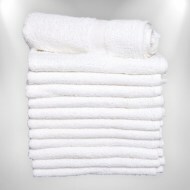 Towel Super Center sells wholesale salon towels that are luxurious and available in bulk. 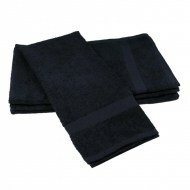 You’ll receive beautiful salon towels for a reasonable price. In no time at all, you'll feel like you're at the spa every time you use a salon towel. 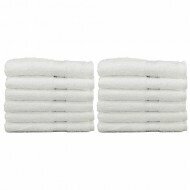 Salon towels set the standard for how towels should feel and work. Their careful construction and classic material help them last longer while still maintaining their softness and absorbency. Size: When you’re looking to get a salon towel, you can choose the size you want. Some might want a small towel to quickly dry off, while others could want a large one to relax in. Consider that different sizes will have different parameters for how to care for the towel. If you get a smaller towel that is 100 percent cotton, expect it to shrink slightly after you’ve washed it. Bigger, heavier towels will take longer to wash and dry. Absorbency: A towel's drying and absorbing qualities depend on the towel's loops. 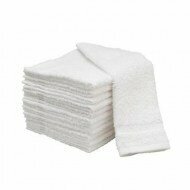 Salon towels have many thick loops that soften the towel and absorb every last drop of moisture. Cotton: You want your towels to have quality, comfortable material. Cotton is an ideal fabric for towels because it hits those marks and it’s also breathable. This gentle material won’t bother your skin like coarser materials. Manufacturing: Towels should last much longer than two laundry cycles. Towel Super Center's towels have tight stitches, so they don't fray or have loose strings. Our salon towels retain their shape and appearance. 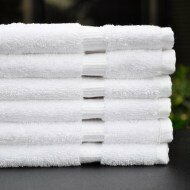 What Is the Importance of Using Quality Towels? Quality towels do more than pamper you. They provide a safe, gentle surface for your skin. Knowing how to towel off properly will help you maintain a healthy complexion and glow. Skin Irritation: When you towel off, your towel will pick up skin particles and oils. If you rub your skin with too much force, you can spread these particles and oils to other places on your body. The most susceptible area is your face. Towels with low-quality materials will irritate your skin, causing skin issues like redness, blackheads or acne. Quality Towels: Salon towels made with soft materials will help reduce skin irritation. You should also dry your face first using light pats. Then you can towel off your body. Consider using a separate hair towel, because residue from shampoo and conditioner can get on the towel and then rubbed into your skin. What Are the Benefits of Buying Wholesale? Usually, a retailer buys bulk amounts of a product and then marks up the value to sell to the public. We don't do that. Towel Super Center sells salon towels wholesale, which has significant benefits. Save Money: When you buy wholesale, you get discounted prices because of the amount you’re buying. You don’t have to deal with retailer prices. 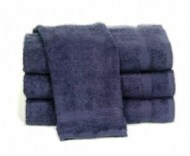 Buy in Bulk: You can get a set of towels for discounted prices. You don’t have to worry about the retailer not having enough of the towel you want. 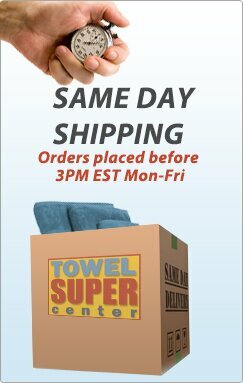 Towel Super Center offer bulk sizes of one dozen and more. Towel Super Center has bleach-resistant salon towels that are specially treated to allow them to be exposed to bleach, but not lose their ability to absorb water and feel wonderful. Anyone can use a bleach-resistant towel. Whether you’re buying for a salon or personal use, a bleach-resistant towel will take care of all your needs. Resistant: Hair salons need towels to withstand contact with hair and nail products. Spas need their towels to stay plush and fluffy after many wash cycles. Bleach-resistant towels resist stains and retain their quality after you've washed them multiple times. Durability: Other towels in retail stores have a chemical coating that makes them soft the first time you use them, but the chemicals wash out quickly, leading to towels becoming scratchy and less efficient at absorbing water. Bleach-resistant towels hold off chemicals and retain their soft, plush feel after you've washed them a few times. Easy care: Separating darks and lights is a thing of the past. Bleach-resistant color towels can be in the same load with color towels. You're saving time and money when you invest in bleach-resistant towels. Buying our bleach-resistant towels in bulk will get you a significant amount of towels that will last for a long time. Towel Super Center offers many materials for towels, including terry towels. 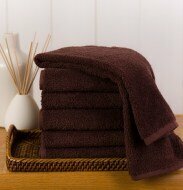 Terry is one of the best materials you can choose for your towels. Cotton is the primary material in terrycloth, and includes polyester, rayon or linen so the material can stretch. Types of terrycloth — There are four different types of terrycloth: Standard, French, micro terry fleece and knit terrycloth. Standard terrycloth is a typical towel material. The fabric features have woven loops on both sides. French terrycloth doesn’t have loops on one side of the fabric. It stretches more than standard. Micro terry fleece has the woven loops on both sides of the fabric like standard terrycloth, but its primary material is polyester. It’s also extremely absorbent. Knit terrycloth is similar to French terrycloth, as it has interlocking loops on one side of the fabric. This material is stretchy and soft. Absorbent: Terry is very absorbent and an ideal material for towels. Hemming: The sides of terry towels have hems so they can go into the washing machine without you worrying about fraying or loops becoming loose or undone. Drying: Terry towels dry quickly and efficiently, reducing the time and potential for bacteria to form. Bacteria thrive in moist areas, so always make sure to hang up your towels and dry them properly. Don’t double up towels on a hook or over a towel bar, because they can’t dry all the way and bacteria can grow in the trapped folds. Never fold and put away moist towels, because this will promote bacteria growth and leave your towels and linen closet with a musty, stale smell. When you get your new towels, you're going to want to take care of them to help them last longer and stay luxurious. Constant cycles with detergents and fabric softeners can damage your towels or make them less absorbent and useful. Taking good care of towels is easy. Use the right detergent: Make sure your detergent works with your washing machine to ensure the most effective wash cycles. Some brands work for both regular and high-efficiency machines, but some have different products for each machine. Make sure not to add more than the recommended amount of detergent. While you might think this makes them cleaner, it does more harm than good. Too much detergent means the rinse cycle won't run long enough to rinse all the soap away. Laundry soap leaves a residue on the towel and can trap odor. The drying cycle will make your towels stiff. When you pull your towels out, they won’t feel plush and might smell musty. If you use them, they won’t absorb moisture well. Add vinegar: Your towels with vibrant colors will set if you wash them with half the normal amount of detergent and about one cup of vinegar to the load. The vinegar helps preserve the colors and remove detergent residue. Wash consistently: Wash your towels every three to four days. After just one use, the towel has picked up some dirt, dust and skin particles. The best towel is always a freshly laundered one. If you’re regularly washing your towels, but can’t seem to get rid of the musty smell, perhaps it’s time to try a vinegar and baking soda rinse. Load your towels into the washer. Add a cup of vinegar where the detergent goes. Don’t add any detergent. Run the washer. After this process is complete, leave the clothes in the washer and add a cup of baking soda where the detergent goes. Once again, don’t add detergent. After the rinse cycle is complete, tumble-dry on low heat. Go easy on the fabric softener: It’s OK to use fabric softener, but you don’t have to use it every time. Try spreading out your fabric softener uses. Another option is not to use the recommended amount of fabric softener and go with less. Too much fabric softener leaves a residue on the towel that will negatively affect the fibers and make your towel scratchy and less absorbent. You could use alternatives to fabric softener that still get the same results. Add dryer balls or clean tennis balls when you’re using the dryer. As the balls bounce around inside the dryer, they smooth out the fabric. Don’t overload the washer and dryer: Adding too many towels to a washer will prevent the towels from getting clean. As they fold or clump together, any dirt or dust particles in the folds won’t be able to wash out. Specks of detergent will cling to your towels if the rinse cycle can’t properly clean the towels. The same principle goes with your dryer. Overloading a dryer prevents everything from drying properly. You can run it for a longer time, but this will cost time and money. If you take towels out of the dryer and put them away while they’re still damp, the moisture will help bacteria grow and make your towels stale and unsanitary. Shake your towels: Give your towels a shake before loading them into the dryer so they dry evenly. Shaking also adds a fluff to the fabric loops and keeps the towels absorbent. If you don’t shake your towels before putting them in the dryer, the process will iron any creases or folds from the washer. Towel Super Center offers a wide variety of towels. 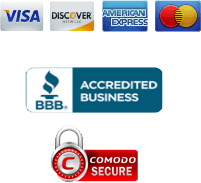 You will find your perfect salon towel because you can search for the specifications you need. Color: Pick your favorite color for towels, and we’ll most likely have it. We offer 22 different colors so you’ll have the perfect towel to match your bathroom. Whether you like crisp whites, royal blue, beige, charcoal or another, Towel Super Center will have a towel color that you like. We also have plain towels with a blue or gold stripe. Consider how often you'll use the towel or what color will fit your needs. Darker colors can hide some small imperfections better than lighter colors. A classic white towel always looks elegant. Mixing and matching is also an option. 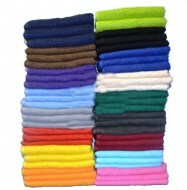 Size: We specialize in all kinds of towels: hand towels, bath towels, gym towels and car wash towels, to name a few. Our towels range from small to large, and we have a huge selection of sizes so you find the perfect size towel. A typical bath towel size is about 27 inches by 52 inches. Our sizes around that are 24 inches by 50 inches, 27 inches by 54 inches — and, if you want a much larger towel, 42 inches by 34 inches. How Many Fabric Qualities Does Towel Super Center Have? Everyone has material preferences. That’s why we offer seven kinds of towel qualities. Bleach-resistant: Cotton bleach-resistant towels won’t get chemical spots or fade, and they absorb all the moisture when you’re drying off. Economy: This grade of towel is tough, absorbent and isn't too expensive. They're perfect for impressing clients and saving money. Our economy-grade towels come in sets of 12. You save more money as you buy more units. Do you have a logo you want us to embroider on your towels? We can do that with the wholesale economy-grade towels. Premium: Wholesale premium towels look luxurious, and don’t break the bank. They’re durable and will impress your clients or look fantastic in your linen closet. Premium towels are good for more than drying off after a shower. You can depend on these towels for uses in the garage, kitchen and the pool. Keep a few in the car in case you need to clean up a spill or wipe off the rain. Premium-plus: Our premium-plus towels are 100 percent cotton and will soak up anything. You don't need a unique cleaning method for premium-plus towels. Run them through the washer and dryer, and they'll be ready to go the next time you need them. 86/14 blended: Poly/cotton blended towels are thick and built for function and comfort. This material breathes easily, so you save time drying the towels outside or in a dryer. 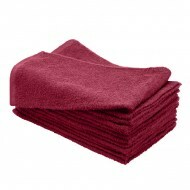 They last a long time, so once you purchase them, you won't have to worry about getting new towels for quite some time. Stains wash out of blended towels. Why wait another day to get quality salon towels? 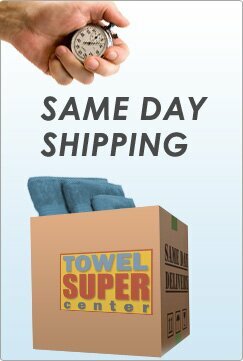 With all of Towel Super Center’s options and wholesale prices, you’ll get the towels you love and need in bulk, at a reasonable price.